CEI's Ultrak 310 is a simple event timer that is ideal for competitors, coaches, judges and other occasional timers! All other entry-level stopwatches (pick a brand) include a mode that takes users out of the stopwatch function and into time, date, alarm, etc. 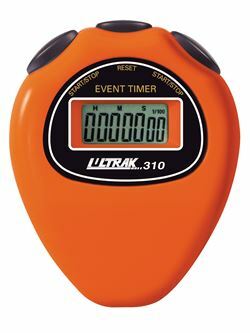 Unlike other stopwatches, the Ultrak 310 is a silent stopwatch - no more embarrassing beeps or alarms during important rounds and performances. The Ultrak 310 is a reliable, single function time keeping device - that gets the jobe done effectively - AND in peace and quiet!